The term "virtual reality" has been around for years, and for about the same length of time we've been promised that it's the next big thing we'll have in our lives. Like so many technological promises, however, it's been mostly vapourware when it comes to consumer products, with only a few baby steps taken on the journey to immersive virtual worlds for us to play in. But it appears to be coming, and if a couple of demonstrations I attended over the past couple of months are any indication, there should be some really cool stuff available over the next few years. I can also see such technology being very handy when it comes to training (why read a dry textbook or suffer through an insufferable lecturer when you can "experience" something first hand?) and in other applications. But it's the entertainment aspects that I sampled in two, well, maybe two and a half demonstrations and I'm quite gung ho to see more. 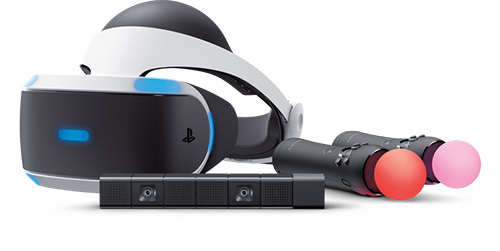 The first was entirely coincidental: I was travelling home from the Canadian Car of the Year TestFest in southern Ontario and Sony had set up a PlayStation 4 VR demo in the departure lounge. I had time to kill, so when there was no lineup at the demo I plodded my paunchy physique over to it and got what was my first ever VR demonstration. And it blew me away! The lovely lady sat me down in a chair more comfortable than allowed in an airport lounge traditionally, strapped on the headphones and visor, and warned me that if I was feeling dizzy or nauseated or otherwise wussy under the circumstances I should raise my hand and they'd bail me out. I had no intention of letting that happen and invited them to throw whatever they had at me. They only had one thing, but it was very cool: I was in a shark cage, descending what appeared to be a couple of hundred feet below the ocean surface. It was obviously a computer-generated universe, but it was a darn good one - maybe not as flawlessly rendered as Pandora from Avatar or the world created for The Adventures of Tintin, but definitely and easily good enough for me to suspend my disbelief for the duration of the demo. So I sat in this shark cage, descending slowly below the boat I could see above me when I looked up, and I dropped through rocky outcrops to a level where a sunken ship was nearby. It was very cool. Then the "ride" part started in earnest: a shark (great white? Maybe; I'm not enough of a shark expert to tell - but it had lots of big teeth) started swimming around my cage, and I could follow it around me as far as I could turn my head (it made me almost wish I were Regan MacNeil, the poor little girl from The Exorcist whose head spun 360 degrees). It swam around, swam away, swam back again. And then it started attacking the shark cage, with me in it! Gone, suddenly, were a couple of the bars before the shark swam away. Whew! Then it was back tugging on the bars and, over the course of a few minutes, leaving a decreasing amount of safety between me and its big jaws. Finally, the entire front of the cage was gone and I sat there, helpless and exposed. Fortunately, once that happened the shark swam away again. I felt relieved, and safer. And so I sat there for what seemed like a couple of minutes. But then the shark swam back suddenly, heading right for the gaping maw that used to be a solidly built shark cage. Closer it came, jaws widening, until it was right in front of me, heading for my virtual flesh and the jig was up and I knew I was about to become a dead, chewed, snack of virtual presence. And just an instant before I was torn to bits the demo went black, the aide removed my PS VR accoutrements and I was safe. Wow! I've been on worse rides at amusement parks, and here I didn't move a muscle other than craning my head in all directions it would go. Well, there may have been some flinching. "Got a roller coaster?" I asked. She didn't, so she patted me on the bum and sent me on my way. Well, she sent me on my way. I was hooked enough that I tried to get my wife to go and try it, but she wouldn't. Of course she doesn't swim and doesn't like my driving style, so an adventure VR like that was completely out of the question. Oculus Rift had a roller coaster, though! I got to experience it during a demo set up for me by the folks at Best Buy Canada, who had the system set up in one of their Calgary stores. I, having jabbered at length about how great the PS VR experience had been, dragged my son with me to prove once and for all that I wasn't completely nuts in my assessment of VR's potential. He was as blown away as I was, or nearly so. For the Oculus Rift demo, we took turns wearing the headphone/visor combo right on the store's floor - and I wished they'd have set up a chair for us like Sony did for the PS4 demo. Oh, I didn't need it for most of the demo stuff, but the roller coaster sequence was unbelievable, and its hills and valleys - some of which were completely vertical drops - were so convincing that it was all I could do not to grab for something to hold. It wasn't as good as a real roller coaster, but it was a heckuva simulation! Other demo stuff included a T Rex stalking through what appeared to be a museum, heading toward us and bellowing in our faces (I wished I'd had a virtual hanky for all the virtual snot!) before stepping over us and going on its way. There was also a sequence that put you right into the action of what looked like a first person shooter game - one of my favourite types of computer games. There were shots and explosions going off all around us as we were immersed in the alien robot attack unfolding in front of and around us. A third demo, the weakest by far of these, came courtesy of LG and their new G5 phone. A VR headset is optional and while it's kind of cool, the virtual world looks as if it's rendered at a resolution of about three pixels (VHS would have looked better) and wasn't much of a demo at all. 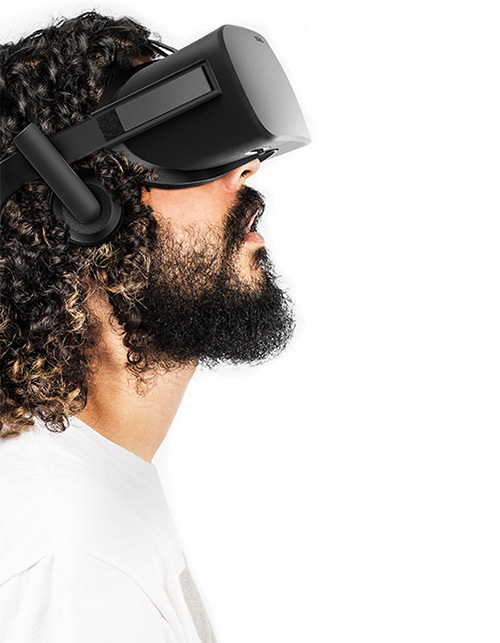 But as with the other demos, it points the way toward the VR future. Not surprisingly, the VR I saw isn't without its issues. While the VR world can be very convincing and enveloping - it's just like stepping inside the game, with your head orientation and moves tracked so well that, as you move your head, the virtual world's image moves along with it naturally in real-time - it quickly becomes obvious that you, yourself, aren't really there. Well, duh, I can hear you say, but this is a flaw they need to fix before the experience becomes truly involving. For example, while I could look in any direction and see the virtual world properly, when I looked down I couldn't see my legs or feet - or any part of me. Despite this being perhaps a blessing in disguise (have you seen me recently? ), it was a definite issue: I was a kind of disembodied virtual presence in a virtual world and since I could tell that I wasn't really there, it was easier to lose my suspension of disbelief (despite having reached for support when sliding down the huge virtual hills on the roller coaster). Ditto for the first person shooter. While it was fantastic being there, I was a ghost character who had no real presence there, and therefore no interaction with the game or its characters. So while the action happened around me, very convincingly, I couldn't shoot back and nothing being lobbed or launched could affect me. There was one instance in which a piece of debris should have bounced off my virtual presence, or smashed in my virtual head, but since I wasn't really there it just passed through me harmlessly and I didn't suffer a scratch. That brings up the need for "virtual motion." Your seat (or whatever you're in) needs to be set up like a flight simulator so when something happens you not only see it but you feel it as well. It's like the Star Tours ride we experienced at Disneyland back in the late 1980's: we didn't really go anywhere but the combination of virtual world and the movement of the simulation car made it more convincing in some ways - even though it was only two dimensional on a small screen at the front of the car - than the all-enveloping VR world was. These issues can and will be addressed, I would think, and the lack of virtual presence and/or interaction with the game may have been fixed already, since my VR experience is limited to what I'm recounting here. But I could see such VR presentations pushing 3D IMAX movies out of the viewing limelight, though it would cost a fortune to equip a whole movie theatre with VR headsets (and I'm not sure I want to wear a public VR headset that hasn't been hosed out - have you seen the 3D glasses they give you at theatres?). It could also be a fantastic technology for learning, or virtual travel. Never been to Africa? Why not go on safari from the comfort of your home? Or how about visiting the moon or Mars? The potential is mind boggling! As is usual in such things, though, it's going to take some generations of the technology to make it really worthwhile. And speaking of generations, it's been about that long in human years that we've been told that VR will be the next big thing. Yet here we are, in 2017, with it still in its infancy. Still, VR can be a heckuva lot of fun and should become even more fun - and maybe even quite useful in the real world - over the next years.